(16/25) TRENTON – With spring wildfire season under way and most fires in the state historically the result of human activity, the New Jersey Forest Fire Service is urging the public to be extra cautious outdoors in order to reduce the risk of fires. Ninety-nine percent of wildfires are caused by people, through accidents, carelessness, negligence and even arson. Being extra vigilant to reduce that risk is especially critical at this time of year, when weather conditions and other factors can increase the risk of wildfires. Obtain required permits for campfires. Don’t leave fires unattended. Douse them completely. People living in forested or wooded areas should maintain a defensible buffer by clearing vegetation within at least 30 feet of any structures. Also, make sure fire trucks can access driveways. The Forest Fire Service strongly urges anyone who owns property in the Pinelands to maintain at least 100 feet of “defensible space” around structures, meaning these areas should be clear of vegetation that will burn easily as well as fallen leaves, pine needles, twigs and branches. Wildfire risk is currently rated as high statewide. The National Weather Service has posted a special advisory for elevated fire potential today as a result of an extremely dry air mass over the state, low relative humidity and dry forest conditions due to lack of precipitation. Risks are likely to continue as a result of continued warm temperatures and dry conditions predicted for the week. As a result of these conditions, the Forest Fire Service has authorized additional staff to patrol and be ready to mobilize to respond to wildfires. Stage 1 campfire restrictions are in place throughout the state, meaning fires directly on the ground are prohibited in all public and private camping areas. They must be in a prepared fire ring constructed of steel, stone, brick or concrete and must have a gravel or masonry base. Stage 1 restrictions are the first in a series of three levels of restrictions that can lead to a ban on all fires in wooded areas, including charcoal fires. Agricultural open burning and use of smudge pots to prevent freeze damage also is no longer permitted and is not necessary due to warm nighttime temperatures. 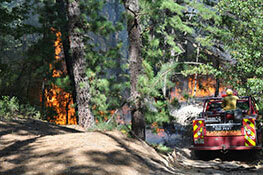 Battling forest fires is a continuous effort. From January 1 through April 17, the New Jersey Forest Fire Service responded to 404 wildfires that burned nearly 1,118 acres, compared with 277 wildfires that burned nearly 420 acres during the same period last year. The State Forest Fire Service works to prevent wildfires year-round through public outreach and education efforts, maintenance of fire breaks and prescribed burning. This year, the State Forest Fire Service burned 17,800 acres through prescribed burns, which reduce fire risks and keep forests healthy by burning away leaves, fallen branches and trees, and dense undergrowth that can provide fuel for wildfires. In recent weeks, authorities have charged a man with arson in connection with a series of forest fires in Winslow Township over a two-year period, and two teenagers have been accused of setting a small brush fire in Newton after Forest Fire Service wardens told police they saw the youths setting the blaze. The basic approach the Forest Fire Service uses to contain larger wildfires is to surround them with containment lines consisting of cleared breaks in the woods, existing roads, and topographical features such as wetlands and rivers. Firefighters light backfires ahead of the main fire to eliminate combustible fuels and stop the main fire’s forward progress. The fire in the containment area will be monitored until it burns itself out.